If you live anywhere in or near Des Moines, IA, and require the services of a bathroom remodeling contractor for a project big or small, the only one you need to call is U.S. Patio Systems and Home Remodeling. Our company, which is owned by home improvement veteran Craig Dauffenbach, offers several different ways to refresh an outdated bathroom without the time, expense, and inconvenience of a full gut and remodel. Bathwraps – Products from Bathwraps offer incredible value for the money. They are made of nonporous acrylic, are resistant to mildew and mold, and are available in a wide range of styles, colors, and patterns. The Onyx Collection – The bathroom remodeling products that we use from The Onyx Collection are made of solid surface material, take just one day to install (same as acrylic), and come backed by forever warranties. 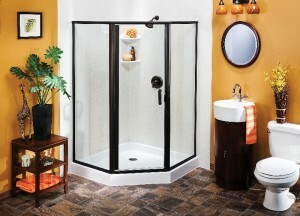 Safe Step Walk-in Tub Co. – Having a walk-in tub installed can significantly lower your risk of being injured in a bathroom slip-and-fall injury. Our walk-in tub supplier, Safe Step, manufactures state-of-the-art walk-in tubs in various sizes with lots of safety and therapeutic features. U.S. Patio Systems and Home Remodeling is an Authorized Service Provider for The Home Depot, has a high Better Business Bureau rating, and was founded by a professional who has had many years of success in the home improvement industry. Contact us today if you live in the Des Moines, Iowa, area and are interested in taking advantage of any of our bathroom remodeling services.